Blake gave me a great idea yesterday by sending me an email filled with old favorite photos. He had become nostalgic looking at his Canon software when I was attempting to upload the same system on my laptop since our desktop upstairs is on the blink. So, I have decided to post photos occassionally of us in our younger years....kids, adults, etc. Enjoy! 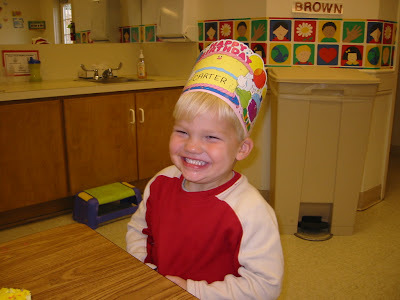 Here is Carter at his 3rd birthday party at Primrose Preschool. We love this one because it shows 100%, pure happiness. The class is singing to him and he's about to burst with excitement. Oh my gosh, I LOVE this photo!